Welcome to our special fall edition of Seeds of Change. 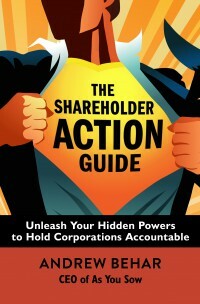 We are excited to give you a sneak peek into The Shareholder Action Guide, to be released on November 15 by Berrett Koehler Publishing. Hailed by Robert Reich as “a valuable call to action for small shareholders to change the ways big corporations do business,” this books empowers shareholders to demand positive, sustainable change in the world. It’s chock-full of stories about getting big corporations to make big changes. We hope you enjoy this preview and are inspired to order the book! The Apple saga is a classic example of a heated negotiation with a notoriously tough corporation that led to positive change: it was the first time Apple publicly addressed the issues of electronics waste and hazardous materials. How did this change come about? Jobs’ reputation as a corporate leader who refused input from anyone – especially his shareholders – is famous. Yet, this announcement came shortly after shareholder resolutions on electronic waste were filed and he had a meeting with the lead proponents. What happened in that negotiation? As You Sow’s work on e-waste began in 2003, led by Senior Vice President Conrad MacKerron, who formed a coalition of SRI allies including Calvert, Green Century, Pax, and Walden Asset Management to press major brands like Dell, Hewlett-Packard (HP), IBM, and Apple to set e-waste take-back goals. Dell, already under pressure from a grassroots campaign, committed to a take back goal in 2004. Later that year HP, which had an initial take-back program operating, accelerated its goal, pledging to recycle one billion pounds of e-waste by 2007. But Apple, in the process of moving from innovative creator of the Mac to a global electronics powerhouse dominating the personal electronics market, was typically silent and not open to dialogue. MacKerron reached out to former Vice President Al Gore, who was on the Apple board. Several shareholder proposals were filed. Still, there was no progress. Finally, at the 2006 shareholder meeting, Executive Director Larry Fahn was able to engage Steve Jobs in a friendly discussion as the resolution was presented, and Jobs agreed to meet and see if progress could be made. The shareholder proposal asking Apple to improve its e-waste policies received a decent vote of 10 percent of shares voted. Like what you see? Read the rest of the story here, and pre-order your copy of “The Shareholder Action Guide” to get a free chapter TODAY. Amazon is offering a 15% discount for all pre-orders!